Khalil Mack is having a wonderful 2018. 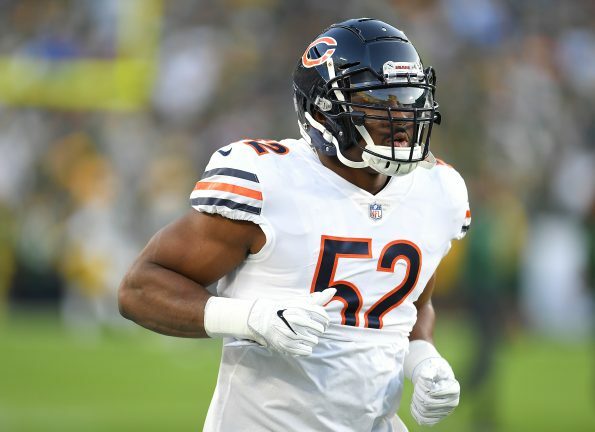 The former Oakland Raiders outside linebacker was suddenly traded to the Chicago Bears just before the season started, where he would go on to sign a game-changing $141 million contract hours later to become the highest paid defensive player in NFL history. His monster first game would be lost in the Aaron Rodgers injury comeback, but it was clear the Bears had made the correct decision. Just days later, Mack would reportedly be spotted getting rather cozy with a woman, and it turned out to be Angela Simmons, the daughter of hip-hop legend Rev Run from iconic group Run DMC. “I head over to Neiman Marcus in Chicago and I see this couple lookin’ all boo’d up, giggling and smiling. Always a work in progress . Naturally achieving my body goals daily . Always room improvement. However , loving myself just as I am is very important . Loving myself just as I am. Everyday is a new day. Some days a I want a flatter stomach , some days I want my arms to be cut up, some days I want to round out my bum more . The biggest lesson I have learned is being content with who I am. Nothing wrong with striving to always be better. But always be good to yourself . Never put yourself down. love yourself just as you are ❤️♥️💪🏾 #BNB #Builtnotbought link in bio !